The use of data has spread to almost every industry. Businesses with 5 employees and 5000, are using CRM systems and analytics to radically improve their sales. Businesses want access to customer data in real-time, with mobile and cloud solutions leading the way. They are redefining the way the customer journey is managed, and gaining insight about what customers want along the path. From executive teams to sales, marketing, and customer success, CRM and analytic tools are helping organisations be more successful at harnessing the power in their data. 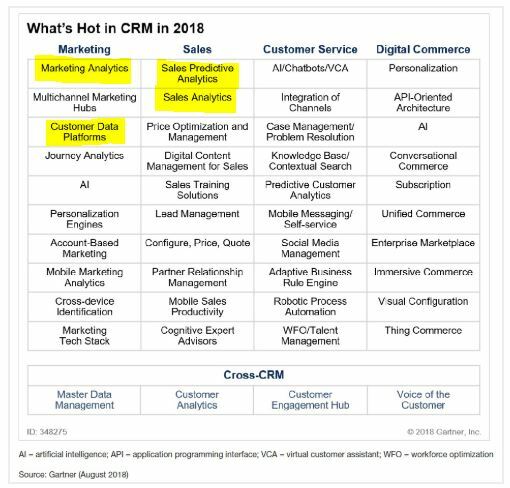 According to Gartner, CRM analytics are a hot topic. CRM analytics however, means different things to different people. Depending on your company goals, team objectives and business model, some types of data are more valuable than others. Where is the best place to start? 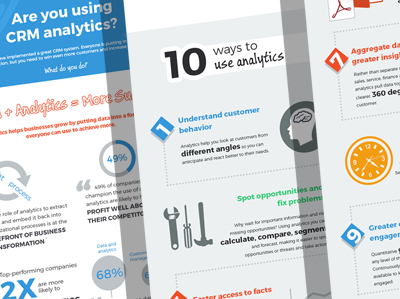 What practical questions or problems can CRM analytics solve? How can data help you hit your targets? We hope this infographic will provide some inspiration. Copy the code below and paste on your site.